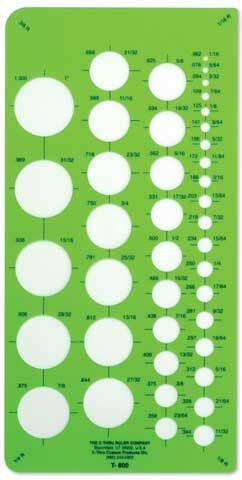 These transparent, flexible, green plastic templates are labeled in decimal and fractional measurements. CTT-800 has 41 circles ranging from 1/16" to 1" in diameter. CTT831 has 45 circles ranging from 1/16" to 1-7/8" in diameter.